If you use one of the AH-mazing Cricut cutting machines, you probably have a love/hate relationship with the cutting mats. Without these mats, we couldn’t do the amazing things we do with our Cricuts. But always knowing which of your mats to use for a project isn’t as simple as it may seem. At this point, there are four different cutting mats — the blue LightGrip mat, the green StandardGrip mat, the purple StrongGrip mat, and the pink FabricMat. But which of the Cricut cutting mats are the right amount of sticky for your project? Let’s talk about this AND how to keep (or restore) stickiness. 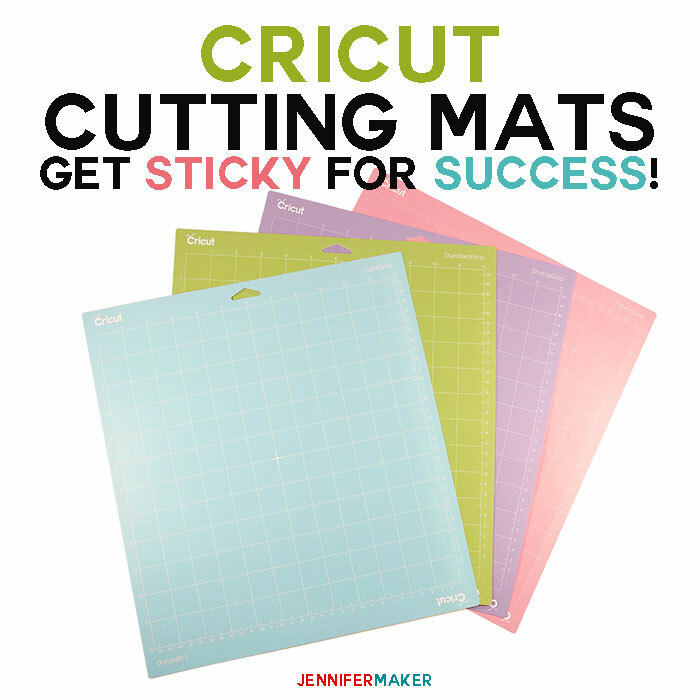 Having just the right sticky cutting mat is SO important for your Cricut project success. In fact, this is my #1 tip when it comes to Cricut projects. Use a sticky mat! A cutting mat that isn’t sticky will cause your material to slide about, causing mis-cuts of various sorts. Also, a cutting mat that is sticky enough will make removing paper-based materials so much easier, because all of the little bits stay on the mat and your project doesn’t need weeding or fiddling about with. If your project just isn’t cutting right, the first question you should ask yourself is this: Is your mat is sticky enough? Note: Cricut updated their mats in autumn 2017—they used to have a floral pattern on them, but now they are solid colors (like all of my photographs in this post). Also, the adhesive seems different than before. They are working fine for me, but some other crafters preferred the older ones. Also, this post contains some affiliate links for your convenience (which means if you make a purchase after clicking a link I will earn a small commission but it won’t cost you a penny more)! Read my full disclosure policy. Ok, so how do you keep the Cricut Cutting Mats Clean? 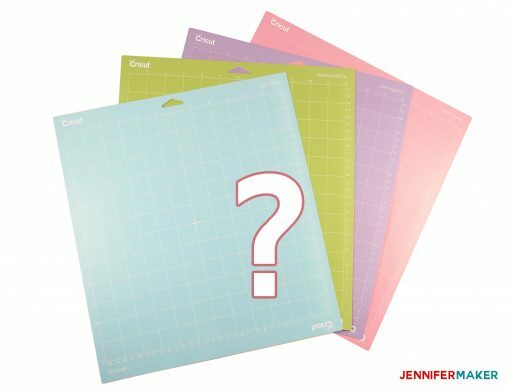 Get my Free Cricut Cutting Mat Cheat Sheet So You Never Forget Which Mat to Use! The Cricut LightGrip Mat is the go-to mat for many people. Cricut recommends you cut the lightest materials on it—for example, copy paper (printer paper), thin cardstock, vellum, construction paper, and vinyl on the blue LightGrip mat. I personally find that these materials cut well on this mat only when the mat is pretty new, however. But, when you just need to cut that vellum, a sticky blue LightGrip mat is definitely the way to go. The Cricut StandardGrip Mat is my personal go-to mat for most of my projects. I have three times as many green StandardGrip mats as any other color in my craft room! I like it best because it remains the stickiest (without being too sticky) for the longest duration. 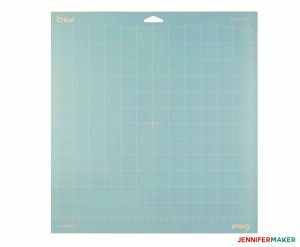 Cricut recommend you cut medium-weight materials on it, such as cardstock, pattern paper, washi paper, and vinyl (self-adhesive, iron-on/HTV, and window cling). I also use it for bonded fabric (in my Cricut Explore Air). I sometimes use an older StandardGrip mat when I cut felt or fleece on my Cricut Maker simply because those materials leave a lot of residue and the green StandardGrip mats are less expensive to replace than the pink FabricGrip mats. In most cases, I would tell you to use this green StandardGrip mat. I believe the Cricut StrongGrip Mat is the least-used mat of the four. When they strong, they mean STRONG. This adhesive’s grip is crazy. And if you use it for material that isn’t equally strong, it will tear or otherwise destroy it. Cricut recommends you use the StrongGrip mat for heavyweight materials such as thick cardstock, glitter cardstock, magnet sheets, chipboard, posterboard, aluminum foil, craft foam, balsa wood, and fabric with stiffener. I cut all my cardstock on the green StandardGrip mat, not this StrongGrip mat. What I use the purple StrongGrip mat for is really thick materials, like cardboard, Kraft board, and leather. 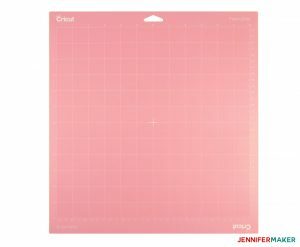 The pink Cricut FabricGrip mat is the newest member of the mat family, having come out when the Cricut Maker debuted. Use the pink mat for fabric and crepe paper. The FabricGrip mat is a bit thicker and stronger than the other mats, but isn’t sticky—it’s intended to just keep the fabric in place as the rotary blade or bonded fabric blade travels over it. The rotary blade doesn’t drag on the material the same way the standard fine point blade does. It’s preferable that the FabricMat be less sticky so when you remove your fabric, you don’t leave too many fibers and threads behind. You can also use this mat with bonded fabric and the bonded fabric blade, too. This mat is the trickiest to keep clean, however! Use a scraper to remove all of the leftover materials after you finish cutting. Wash the mat with water and gentle dishwashing detergent, then allow to dry. Note: Some people like to re-apply adhesive to their mats. If you do this, do so with the knowledge that this can void your warranty on your machine because it can gunk up your rollers. But if your warranty has expired and you don’t mind experimenting, you can tape the edges of your mat and use something like 3M Spray Adhesive (the repositionable type). Use tweezers, the Cricut spatula, or Cricut’s Strong Grip transfer tape to clean FabricMats. Do not use soap and water or any other cleaning agent on a FabricGrip mat. For extra fuzzy materials, like felt and fleece, consider putting transfer tape behind your fabric before sticking it to the mat—this will keep your mat free of fuzz. Note: The Pink FabricGrip mats will continue to work even with leftover fabric and fiber remnants on the mat—the rotary blade will cut right through them. Want to remember this? Save the Cricut Cutting Mat post to your favorite Pinterest board! Jennifer Marx is a designer, an enthusiastic crafter, a lifelong teacher, and a proud overcomer of a variety of life's challenges. In her spare time she loves to play D&D and video games, garden, sew 16th c. costumes, and go to Disney. She lives a full, happy life in beautiful Ann Arbor, Michigan with her partner Greg, her teen daughter Alexa, and their two dogs, Hunter and Chloe. Success! Now check your email to confirm your subscription to the 30-Day Craft Room Organization Challenge. From one Jennifer to another, I’m excited for your 30 day organizing challenge!! I did get a 4 day head start on my own, but I know it can be better! My sleeves are rolled up and I’m ready to go!! Thanks for the encouragement and guidance! You are my FAVORITE “go-to” cricut maker person. I’m so grateful for all your posts and websites! Success! Now check your email to confirm your subscription to the Cricut Mini-Course. There was an error submitting your information. Please try again. I inspire you to make crafts and decorate your home. I'm always working on something new and fun! Follow along on my DIY adventures, reconnect with your creativity, and read more about me here. Join 125,000+ other crafters like you who enjoy JenniferMaker.com! BONUS: Sign up for the JenniferMaker.com newsletter and II'll send you the password to my top-secret library filled with free printables and patterns. Once subscribed, I will send you a newsletter with details about my new free files each week. Success! Now check your email to confirm your subscription. The password to the free resource library is craftthelove --- the link to the library is http://jennifermaker.com/resource-library, which you can also find at the very top of this page. Enter my top-secret resource library for my latest printables and patterns! Password is 'craftthelove' -- thanks for being a subscriber!! Get access to my free craft library! Subscribe (free!) to my newsletter! As an added bonus, I'll send you the password to my top-secret craft library filled with free files and patterns. Resource Library Enter my top-secret resource library for my latest printables and patterns! Password is 'craftthelove' -- thanks for being a subscriber!! Have a Cricut? Check out my new book! You’re welcome and encouraged to link to JenniferMaker.com or use a single image with a brief description to link back to any post. Republishing posts in their entirety is prohibited. Feel free to pin on Pinterest! You're welcome and encouraged to link to JenniferMaker.com or use a single image with a brief description to link back to any post. Republishing posts in their entirety is prohibited. Feel free to pin on Pinterest! Jennifer Marx is a participant in the Amazon Services LLC Associates Program, an affiliate advertising program designed to provide a means for sites to earn advertising fees by advertising and linking to Amazon.com.